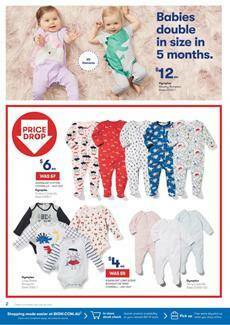 Bonds Zippys, Dymples cotton coveralls, cardigans and more for babies, and toddler casual wear are available in the first part of the Big W Catalogue 31 Jan - 13 Feb. Price drops on coveralls that are warm and comfortable for all babies can be seen on pg 2. Big W sells Dymples fully knitted cardigan for only $20 this week. See colourful ideas of clothing including coveralls, sleeping bags, pyjama sets on pg 4. This is a great place to find a fair price for a decent product for all kids. Its original way of profitable shopping makes an easy path to the savings. 40% discount is a valid deal on Bonds babywear. Check out that discount and more products on pg 5. Moreover, if you like Harry Potter movies and the style of its stories, you might also love the products of toddler clothing. See that part of the catalogue on pg 5. Dymples fleece sweaters will cost only $4 at Big W Stores. Casual clothing is also a thing to find on the new catalogue. B Collection casual kids' items including denim pants are also great offers. Find them on pg 8-9. Girls' dresses like B Collection fleece print dress are viewable on pg 10. Follow the Facebook page for more deals, future Big W Catalogues and more posts like this.